OFD again. The cave of the black spring, with its long, dark meandering master streamway, with its labyrinthine passages, with its often concealed decoration gems. I was keen to explore more routes leading off the usual loop from the top entrance, so, with Dave, Will and Noah we made the plan to visit Lugubrious passage, Déja Rue and the Northern Lights. A member of the Cambridge caving club helpfully gave some hints about the various landmarks en route to our objective. Arriving at the Shatter Pillar via Selenite Tunnel, I remembered that the start of Lugubrious steamway was found down a hole through boulders just behind the pillar. We crawled and stooped, twisting left and right before the way opened up again. The passage was filled with the low rumble of a stream. Heading on, we soon spotted another downclimb, which allowed access to the course of the water. Dave went first and gave me a thumbs up once safely down and we all followed. After a while, the narrow sinuous streamway dropped below our feet so we traversed to a junction with a large rock bridge spanning the right hand fork. This, I knew from looking at the survey then, led to Midnight Passage. By traversing over to the left however we quickly reached a sandy balcony over the Main streamway of OFD, where we had a bit of water. The balcony was a kind of small oxbow, rejoining the Lugubrious passage further down. It was then that the traversing started to get interesting, with the streamway running five metres underneath. Soon, a dry, dusty phreatic oxbow beckoned to the right. It was similar in size and shape to Selennite tunnel, the walls displayed a profusion of fossils, such as a particularly well preserved coral 20cm across. The oxbow straightened, a thin white calcite line in the ceiling guiding us down until the passage stopped abruptly, hitting the main streaway again at right angles. The sound that rose from its misty depths was low and ominous. Turning around, and traversing back up, which was good fun, we arrived the rock bridge junction again and set off in the direction of Midnight passage. Soon, a rock pillar eerily similar to the Shatter Pillar appeared in front of us. The chamber whose roof it was supporting however, was much larger. Pausing to eat our lunch there, we considered our options and decided to go for the Northern Extensions first, and if time allowed, to make the excursion towards Déja Rue. After much peering at the survey, we set-off towards the higher end of the chamber, across the boulder strewn passages to a short downclimb and a further ascent. To our right, tapes were appearing and we saw the reason why: dried crystal pools with honey yellow calcite spar glittered under our lights. Further up, we squeezed through boulders to break back into a similar passage, but there was a bit of a stream again, and, we noticed, the soothing melody of drip. At the end of the passage, we were faced with three options: a climb up boulders by the drip – where I rather foolishly tried to refill our water bottle -a short, dry, twisting passage leading off to the right and an unenticing knee-high crawl through water. After exhausting the former two options, and making certain we were in the right place by a short gander downstream, I declared that I would go in the damp crawl and report back on developments. It was, as expected and indicated by hints of the Cambridge caver, the way on. Dave, wearing cotton socks at the time, managed to keep his feet dry, as the cramped passage opened up a little. Noah, Will and I were not so fortunate. We were immediately within a boulder choke, and getting nearer the stream, we progressed upwards to little aven with water cascading on the black rock. I filled the bottle there, and we got on, half-sliding through a tube and dropping into another, pebble-floored stream passage. Then we found the start of Lavender way, a traverse over a frothy, brown stream on muddy ledges. After a final squeeze through (not entirely stable) boulders we broke into ‘The Vault’, which was nothing more than a modest chamber, at the top of which lay a traverse line. We could not reach it by climbing, and I surmised that it was the junction with another access route to the Northern Extensions. By squeezing up a rift to the left however, we found the second chamber, which was soon followed by two more. A large, knotted hempen rope led off, four metres above a cone of very white boulders. Here, Noah and Will followed up me up into a large, spray filled aven, whereas Dave, having attempted the climb several times told us to continue without him. We got together and allowed ourselves half an hour of exploration in the Northern Extensions before joining back up. The most remarkable bit of cave there was Mudlust hall, a chamber accessed by short muddy crawls. This passage must have had a pool for long period of time before it was drained thoroughly as moonmilk covered the walls up until the waterline, a very sharp, horizontal boundary between the soft, creamy calcite and the rough black walls. The mud that had accumulated within that pool was also dissected and offered stunning cross sections through the sediment sequence but enough about this. The mud crawls continued and we reached yet another rumbling stream ,which we followed downstream until a rope came down from above. This was a hempen rope again, but it was unknotted, and the walls were made of friable moonmilk. Will sensibly requested that we do not attempt this dodgy climb. Although we turned around here, we were then pretty sure this was the start of Moonmilk revelry and the gateway to the Northern Lights proper. We were running out of time, and as Noa put it then, it would give us something to go back for, so we retraced our steps, reptating through the mud and admiring yet more calcite formations in the Northern Inlet. Having rejoined Dave in the fourth boulder chamber, we set off towards Midnight passage again, through the thrutchy Lavender Way, through the boulder choke and through the damp crawl. There, instead of squeezing back through to the calcite pool passage, we turned downstream, to a high passage, where two streams joined. Straight across, we stepped on the calcited boulder ramps, climbing higher and higher towards Déjà Rue. At the apex of the climb, a neat wall of stacked boulder heralded the site of Haydn’s Dig. A short crawl got us to the other side, in a larger phreatic passage. Déjà Rue was a small extension, but some of the formations were certainly worth the detour, with drops of caramel coloured calcite coating the muddy floor, and similar flowstones. It ended at a silted sump, which had the tiniest of streams feeding it. Content that we had achieved all of the day’s objectives, we turned around and made a swift exit via the Corkscrew squeeze. It was only standing on the mountainside, into the drifts of drizzle that we noticed how muddy we’d got, with barely a part of our oversuits not coated in that gloopy red-brown clay. On the way down the hill, Jack and Jack (the Younger) caught us up, having returned from their own trip to OFDII. Exchanging news and trip reports we trudged down the green lane, until, rising suddenly before us, the cottage came into view. Spurred along by the promise of hot food and a long night of revelry, we opened the doors and got inside. Our group had numerous novices, but enough experienced people to split up into teams of four. Rhys and I decided to have an exploration of OFD, accompanied by Mr Jack and Ambia. The weather on the surface was appalling, so I claimed the honour of entering the cave first, and we were soon into the darkness at the Big Chamber near the Entrance. Here we turned off our lights to appreciate the darkness, and indeed the silence that came as the high pitched whining from Mr Jack finally ceased. Rhys arranged us all with flashes and set about illuminating the entire chamber, resulting in some pretty nice shots. Next we went down Gnome Passage, and down the Corkscrew into Salubrious passage. There was more water than usual in this streamway, but we pressed on to the Trident and the Judge for some more photos. After this we headed towards Swamp Creek, where was I was keen to see if there was a connection from a parallel passage, as suggested on the survey. The parallel passage was nice, with a sandy floor and some stooping sections, but the connection to Swamp Creek came in a terrifying five or so metres up, and we decided that we wouldn't free climb it. There were a few other ways on that we pushed, including one with some nice snot coloured helictites, but the way on was barred with conservation tape, so we turned back. At a junction, I found some beautiful crystals in the floor - thin needles of transparent green, closely packed to make a slab about an inch thick, which had been broken underfoot. I'd love to know what it was, but couldn't justify taking a sample to show Tanguy. We then decided to head up Swamp Creek, which was as entertaining as ever. It really is easier to just stand up and use the ledges as foot holds, rather than crawling along them, but for novices this can be intimidating and so progress was slow. I enjoyed the side trip, but I think some people were glad to be back on solid rock under foot, as opposed to a void. We returned back past the Trident and the Judge, and headed towards the Crossroads and Selenite tunnel. The traverses are quite airy, and would benefit from some rope, but we were soon across and admiring the dark polished glory of the selenite. Vowing to return to take pictures, we tried a few side passages which eventually reconnected with the Shatter Pillar Chamber. Tanguy had kept mentioning this landmark, but I couldn't place it in my mind until I saw it - it is obviously a shattered pillar in a chamber! From here we decided to get into Lagubrious Passage, but the survey was vague and poorly photocopied. Instead of taking the downwards route in the floor of Shatter Pillar, we took a passage that lead to the Crystal Pool and the ladder. Just after the ladder, on the left, we crawled down into a side passage, and were surprised to see another group of cavers below through a small window. We shadowed them on our higher level route, and eventually met in what they told us was the Cross Rift. We weren't in Lagubrious at all! Making use of our unexpected location, we pushed some side passages to get the labyrinth slightly clearly in our our minds before returning the Selenite tunnel for a photo session. The traverses weren't so bad on the way back, and looking at the Survey we reckoned there might be a way to get into Gnome Passage without going via Salubrious passage. After following going upstream for a bit we realised this route didn't go, but it terminates in a very pretty blue pool. We backtracked, regained Salubrious and were up the Corkscrew in no time. At this point, Ambia and Rhys headed out, but Jack and I were keen to continue. First we made it to Shale Chamber, just off Gnome Passage, and then we went down the White Arch Series, a fun passage with some nice free climbs and an airy traverse at the end that reconnects in at the bottom of the Gnome Passage collapse. This took less time than we anticipated, and I recalled a crawl off Gnome Passage that connected back into the entrance. It wasn't on the map, but I figured we'd just try some crawls until we found it. A likely looking hole presented itself on the west side of the passage, just near where it begins, and I thrust myself in. Quickly it became tighter, but I was hardly about to admit defeat with Jack right behind me. I grunted and thrutched my way through to a grim dog leg that became very tight, and decided that here was a good place to turn round. Mr Jack behind me agreed, but after seeing me turn around in the passage by jamming my knee into my eye socket, he decided to back out. Soon we were back in a wide open space, large enough to be able to swing your nose in, and we agreed never to try that crawl again. The new OFD survey shows it as a going lead! Not quite defeated, we went to check out the Bedding Chambers, which overlie Gnome Passage. There's a tough free climb on calcite up, but then it's quite pleasant, with nice formations and an eery sense that there isn't much rock beneath you. We turned back at some point, returned to the hut for burritos, drinking games and a communal oiling session. The second day of caving dawned fresh and windy, but mostly dry and as a result, the majority chose to go to Cwm Dwr. The rest opted for a lie in, some walking around the hut but generally milling around, recuperating from the night’s antics. Two teams were formed, the lightning vanguard (Nick, Chris, Noah, Will and I) would follow in the wake of the CCCC, with a mission to chase and pursue, while a motley crew of novices stiffened by the old guard (Jack and Jack, Rhys and Ambia) brought up the rear, keeping other visitors at bay, with clear orders to leave no quarters. We swept into the entrance series of the cave, through the wet crawl into Cwm Dwr Jama, where suddenly, the ceiling rose up and became decorated with pure white formations. With little trouble, we sauntered off towards the Cwm Dwr choke, passed it, aimed for some sedimentary appreciation at the Sand Banks and carried on towards the Confluence via the dry Nether Rawl and Picadilly route. At a large five ways junction we spotted the lights of the CCCC group and chatted for a bit, discussing the position of yesterday’s foamy waters, which had backed up several metres above normal levels. While this group had lunch at the junction, we wandered off towards the divers’ pitch, a narrow, drippy aven reached by a gloomy, grey phreatic tunnel interspersed with large, dark and murky pools. The rock suddenly turns blue-black, with large white veins all over near the climb which is the rather unfortunately named non-diving connection with OFDI. On the way back to the five ways junction, we had a little poke around for the passages that end in Main Streamway sumps on the map, finding some cobble strewn, desolate small passages, some scalloped floored streams and another deep pool which had to be passed to complete a small loop. Back in the larger avenues of the cave, we paused and ate Soreen, taking in the squidgy energy before our march upstream to the confluence. As we moved over the large and straight passage to the meeting of the main streamway with that of Cwm Dwr, we could not help but notice how high the foam had got during the previous day. It was a short walk to the confluence, which is easily spotted: a large, triangular protruding rock stands in the middle of the two streams, and the main streamway issues from a stooping passage to the right. From there, looking at the time and at the water levels, which had dropped back to normal, I decided that we could have a short 15min wander upstream to the first river chamber. Upstream it was, along the decorated, sinuous streamway, with its little potholes and flumes, riffles and pools, until a short traverse over the cascading stream broke into the First River Chamber. From there, we had a quick look upstream and turned back to the confluence, which we reached in no time at all. After that, Picadilly and the gour pool passage with is drippy waterfall. At a junction where a small stream comes into the main passage, we explored the little maze of passages upstream, spotting gypsum crystals growing at head height on the sand covered walls, until finally we turned towards the exit. Just before the final concreted climb we met with the Cardiff club who were on their way in, and seeing as we had plenty of time before us, we let them all in before getting out. Our second Soreen was consumed whilst waiting for the group to negotiate the climb. There was a bit of drizzle on the very short walk back, but a hearty meal of egg-fried rice and the spectacle of a Rescue helicopter taking off next to the hut lifted our spirits. Content that once more our caving needs had been met, we packed up our kits and loaded the minibus. With the same team as yesterday, we entered Cwm Dwr. After examining the entrance crawl, Rhys and Ambia decided to head out, leaving just me and Mr Jack. 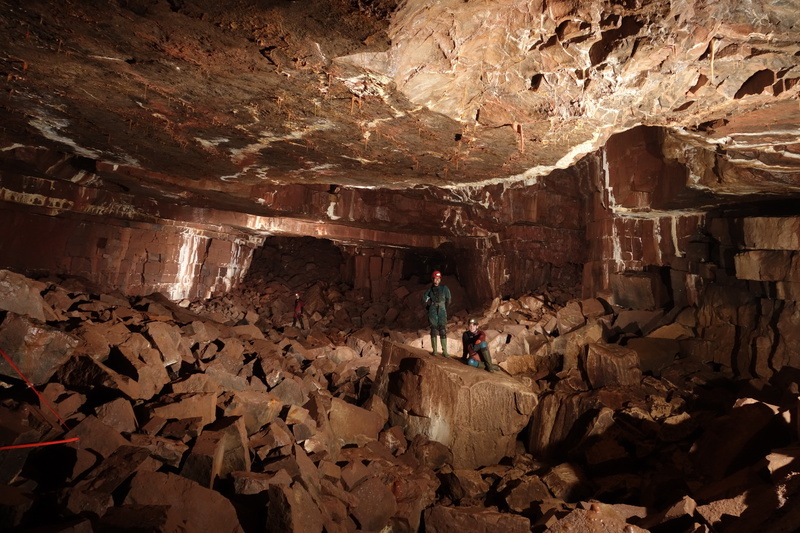 I'd never been in Cwm Dwr, and this was Jack's second cave - what could go wrong? We mistook the first entrance crawl for the main entrance crawl, and so as I turned a corner and saw the low, gravel filled continuation my hear sunk. It's not the worst crawl I've done - it compares favourably with Brown Hill and even Daren, but it is still arduous, and the final part where you have to practically dunk your head in the water is quite refreshing. Soon we were in Cwm Dwr Jama, which was impressive in its scale and decoration. We plunged onwards, admiring the cave and looking for signs we had reached the boulder choke. I hadn't memorised much of the advice given to me, apart from to look for two scaffolding bars and to start with a crawl on the right. Plunging in, I followed the polish for a while, and popped out into a chamber with no way on. A quick backtrack saw me out at the top of a large slope of boulders, with the water flowing towards me. This was confusing - I'd assumed the water would continue downstream, but I had just navigated a boulder choke so it seemed worth having a poke about. Back at the choke, I went down into the streamway straight away. Then following the polish lead me to first one, then two scaffold bars. Soon we were out in a very different chamber, that more clearly matched the survey. We checked out some side passages before going to the far end, where a brief flat out crawl links into a large perpendicular sand filled passage. Shortly after this we turned right towards the Main Route. We met the CCCC, who told us what Tanguy's team were up to, and we decided to try and reach the Flood Bypass down Nether Rawl. This worked well, and the cave becomes truly incredible after this point, with huge, soaring passages, paved with calcite flows and covered with thin sheets of water running down like an elegant fountain at a stately home. I couldn't quite make the survey match what we did, and soon we were a bit lost. Pressing on lead to a spray filled chamber that we believe was the Diver's Pitch, but we turned back and followed the water downstream. Jack spotted a very confused looking frog, but we couldn't think of a good way to rescue it and left it to its grim fate. The water flowed away through a low side passage and we walked upstream, noting the foam high on the dark, brooding walls. We soon reached a pointy rock that could only be the Confluence, as described to me by the CCCC. This made no sense to me, as I had thought the Flood Bypass was a dry, fossil passage instead of an active streamway! We decided to head back the way we came, and as we went we spotted more landmarks to confirm that we had in fact done the route we set out to do. Back at the Smithy we bypassed the Hole in the Floor and rejoined the main route, heading out with increasing confidence. The boulder choke seemed a lot quicker, as did the crawls - for reference, the entrance crawl took Jack and I 8 minutes (not a speed challenge, but a useful measuring stick). Back at the hut for egg fried rice and a quick departure back to South Kensington!